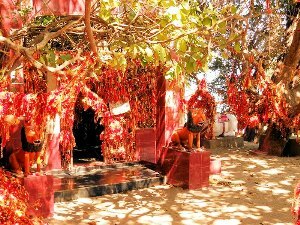 The Ghanteswari Temple, also referred to as Maa Ghanteswari Temple, is situated 33 km south-west of Sambalpur, on the banks of River Mahanadi. This temple is famous for its wish fulfilling bells that are offered by the devotees, to the goddess of this temple. These bells are seen all around this temple and were also used to warn and guide early sailors. The area around this temple is a conglomeration of three streams. The Mahanadi river used to have many whirlpools in earlier times and many boats used to drown in it. So, to warn any sailor nearing this spot, the bells of this temple were shaken fiercely to produce loud sounds. Due to this, this temple is also called the ‘lighthouse without light’. The place became safer after the construction of the Hirakud Dam, nearby. The Chiplima Hydro Power plant is also situated near this temple.